What Are the Main Reasons Workers Suffer Crushing Injuries at Their Jobs? There are many types of workplace accidents where workers are caught between or in heavy machinery or other large objects that result in them suffering crushing injuries. These accidents can cause debilitating injuries that can leave workers unable to work or even cause their death. According to the Occupational Safety and Health Administration (OSHA), caught in and between accidents is one of the “fatal four” in construction deaths, causing 7.2 percent of all construction workers’ fatalities. However, workers in New Jersey who suffer crushing injuries may be entitled to workers’ compensation benefits. What Are the Common Causes of Worker Crushing Injuries? Forklifts. Forklifts are used in many industries, such as factories, other industrial plants, and warehouses to transport heavy loads and other goods. A forklift can cause crushing injuries if it tips over onto the operator or another worker or traps the person between the forklift and another object or the loading dock. In addition, workers can suffer these injuries when the forklift operator does not see them working nearby and runs over them. Bulldozers and front-end loaders. Operators of these heavy machines can suffer crushing injuries if the bulldozer or front-end loader overturns or falls off a jack stand. Co-workers face similar dangers as employees working near forklifts. Auto repair equipment. Mechanics can become caught between the arm of the hydraulic lift and the ground or another object if the lift fails or is unexpectedly lowered, with crushing injuries being the likely consequence. In addition, these workers can experience a crushing injury if a jack stand overturns or otherwise malfunctions and allows a vehicle to fall onto them. Warehouses. Warehouse workers and shippers can be injured if heavy pallets or other materials fall onto them. 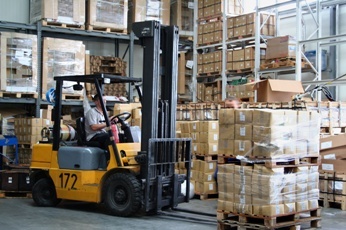 In addition, forklifts are frequently used to move goods or load them onto or off trucks, increasing the risks of a worker suffering crushing injuries in a forklift accident. Cranes. Crane riggers, construction workers assisting with crane operations, and other nearby workers can suffer these injuries if a load of pipes, steel beams, and other heavy materials are dropped onto them. Granite and stone slabs. Workers who must unload or work with granite and stone slabs that can weigh thousands of pounds can suffer fatal crushing injuries in workplace accidents. Farming. Farm workers are at risk of suffering a crushing injury if caught between an animal and a fence or gate or heavy machinery tips over onto them. Motor vehicles. Many workers must drive as part of their job duties or drive full-time, such as delivery drivers and truck drivers. If they are injured in a motor vehicle accident, they could suffer crushing injuries to their bones or organs. What Crushing Injuries Could You Suffer in a Workplace Accident? Workers’ comp claims for crushing injuries tend to be more complex due to the severity of the injuries and the likelihood of a permanent disability or deaths. This often makes the value of a worker’s claim higher, which can lead to more disputes about his entitlement to workers’ compensation benefits. Adjusters will often argue about the severity of the injury or whether it really caused a partial or permanent disability. If you suffered a crushing injury in a workplace accident, you need an experienced workers’ compensation attorney on your side. I have been helping workers fight to obtain the workers’ compensation benefits they are entitled to for over 20 years. Call my office to schedule a free consultation to learn how I can assist you too.